Has Dean Ambrose become Lazy? Last Monday, on Monday Night Raw. 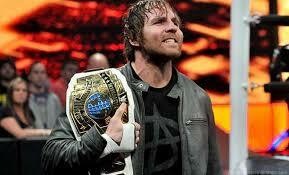 A segment happened between current Intercontinental Champion, Dean Ambrose and the former holder, The Miz. after the segment and show ended, rumors came out saying that Ambrose has been called from backstage officials “Lazy” and that his first round pick in the WWE Draft and run as WWE World Champion were a bad choice made. Now, this has gotten everyone to talk about it, give out their opinions and given some the time to bash both WWE and Ambrose. So, this is my opinion on the situation. Last year at Wrestlemania 32. Dean Ambrose went one-on-one with Brock Lesnar in a street fight, that everyone thought was going to be bloody and brutal. but instead had Lesnar do suplexes, not allow Ambrose to have that much of an upper hand, and end the match at ten minutes. Before WWE’s annual Money in the Bank event, the WWE made it very obvious that Ambrose would win the Money in the Bank match, cash in on either Seth Rollins or Roman Reigns and have his big moment as the top guy in WWE. That was until the WWE Draft happened and Ambrose was Smackdown Live”s first round pick, This marked where Ambrose no longer showed passion or care for anything he did, acting as a heel and showing a new side for his Summerslam match against Dolph Ziggler, for the WWE World Championship. that would end when he suddenly lost it to AJ Styles a month later. His feud with Styles ended after December for WWE’s Tables, Ladders and Chairs event where he was unsuccessful in winning it back on multiple occasions. For four months now, Ambrose has been either a time filler or a place holder to being unrecognized for everything he has done in and for the WWE. Last year he was the final two in the Royal Rumble against Triple H, he had a match with Brock Lesnar at Wrestlemania 32, He won the Money in the Bank, was WWE World Champion and this year became a two time Intercontinental Champion. With people calling him lazy, I wouldn’t because when you want the best out of your career, you go for it, but when people backstage begin speaking about you and not allowing you to make the best out of something, that ruins your motivation to keep going. I will agree that it’s bad that the Intercontinental championship was put on the pre show of Wrestlemania, after what it has been through from the feud between legends like, Savage Vs Steamboat, Michaels Vs Ramon and Piper Vs Hart. Ambrose suddenly won the Intercontinental Championship, but it’s not his fault it was on the pre show, when they had more matches to put on whereas Ambrose facing Baron Corbin was announced two weeks before the event and wasn’t hyped that much as the other matches were and when put on the pre show, gave everyone a negative reaction towards Ambrose. I’m very hopeful that this will change, people will change their opinion on what’s happening and not focus on backstage politics and more on the sports entertainment that WWE provides to us. This entry was posted in Wrestling and tagged AJ Styles. Roman Reigns, Baron Corbin, Brock Lesnar, Dean Ambrose, Seth Rollins, The Miz, Wrestlemania, WWE, WWE Intercontinental Championship, WWE World Championship on April 23, 2017 by Rami Hanna Jr.